that was bigger than our whole world. 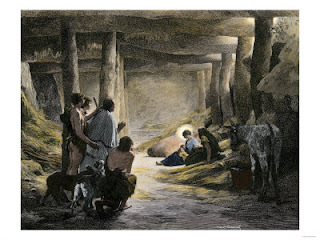 We won't get hung up on whether our Lord was born in a stable as opposed to a lower room in the house where animals were often brought in for the night because the 'inn', meaning guest room was occupied. What I'm interested in here is Lewis's theological insight that Jesus was at one and the same time inside the 'stable' and bigger than the whole world in which the stable was set. He is emphasising that Jesus became what we was not [Man] without ceasing to be what he was [God]. He is Immanuel; God with us as one of us. This is sometimes referred to as Calvin's extra. Although it can easily be shown that in teaching this the Reformer did not in fact add anything extra to the church's understanding of the person of Christ. His thinking was in line with historic orthodoxy. In his chapter devoted to 'The Extra' in John Calvin's Ideas, (Oxford, 2004) Paul Helm cites E. David Willis's view that the extra Calvinisticum could well be called the extra Catholicum. Another absurdity which they obtrude upon us, viz., that if the Word of God became incarnate, it must have been enclosed in the narrow tenement of an earthly body, is sheer petulance. For although the boundless essence of the Word was united with human nature into one person, we have no idea of any enclosing. The Son of God descended miraculously from heaven, yet without abandoning heaven; was pleased to be conceived miraculously in the Virgin’s womb, to live on the earth, and hang upon the cross, and yet always filled the world as from the beginning. Calvin, J. (1997). Institutes of the Christian Religion II:xiii.4. Bellingham, WA: Logos Bible Software. Source critics argue that Calvin was familiar with Augustine's letter and his words in the Institutes quoted above bear the imprint of the Church Father's influence. But what of the fact that Scripture speaks of the Son being given [as a man] John 3:16, or that the Son was born of a woman Galatians 4:4.? Does that not suggest that the Son became man and nothing else at the incarnation? No. Calvin drew upon the notion of the 'communion of attributes' to help explain why the Bible designates human properties to the divine Son. This lays down that aspects of one or the other nature (divine or human) may be predicated to the whole person of Christ. In so doing both the unity of Christ's person and the integrity of his divine and human natures are preserved. According to the witness of Scripture Son was not only 'born of woman', he also 'gave himself for us' at Calvary, Galatians 2:20. How could the eternal Son begin to be, and the immortal One die? In his divine nature he could not do either of those things. But in the incarnate Christ we have the person of the Son with divine and human natures. The Son was born and died for us in his humanity. But we do not hold that the human nature of the Son gave itself for us, but that the Son died in our place in his human nature. That which may only be predicated of Christ's human nature is attributed to his person as the Son because what he did through his human nature was a personal act on our behalf. Calvin's careful use of the 'communion of attributes' doctrine is in line with Chaldeconian 'one person/two natures' Christology and helps us understand the way in which the New Testament describes the work of the incarnate Son of God. May I conclude with a plea for extra worship? Loose theological talk continues to find its way into our hymns that sing to Jesus, 'You laid aside your majesty', or 'you left your throne and kingly crown'. The idea here is of divestment of glory and abandonment of sovereignty. But that is not what happened at the incarnation. John tells us 'the Word was made flesh and we beheld his glory'. The government of the world was not neglected when the Son was born of a virgin in Bethlehem. Jesus continued to 'uphold all things by the word of his power' (Hebrews 1:13) even as he was cradled in Mary's arms. The Son's aseity (that he exists in and from himself and all things that exist are from him and depend upon him) was not compromised when he became a weak and vulnerable baby in need of his mother's milk. The language of some of our hymns (and sermons?) goes beyond what might be said under the heading of the 'communion of attributes'. For while the Son was born and died, we are not told in the New Testament that he laid aside any aspect of his divine being, or that he stepped down from the throne of the universe when he became man. Thank you, very much. I think one of the reasons, perhaps the main reason, we don't on the whole have much understanding of the theology of the incarnation is Christmas. This is the time of year for cosy carol services and sermonettes; at every other time of the year to ask the question 'Cur Deus homo?' is held to be unseasonal. This in itself is a good argument for returning to the old nonconformist, and Puritan, practice of leaving Christmas out of the calendar. And since most Christians learn their theology from the hymnbook, rather than from exposition, your piece is a reminder that we need to get rid of the bad hymns. Is that a picture of Mary with a halo? In that case, shouldn't all present have haloes, in order to be consistent? “I wish it could be Christmas everyday” Really?